Lost in the Fae and hounded by enigmatic spirits, the brave druids of the Baruitha clan gather to perform sacred rituals in honour of these mystic denizens. Appeasing the creatures my be critical to the survival of the clan in this extraordinary realm. In Fae, 2-4 players assume the roles of wayward spirits within the mystic realm of Fae, obscuring their identities from each other while influencing and luring the lost druids throughout the strange lands. As the druids gather and isolate themselves, they perform rituals that award points. 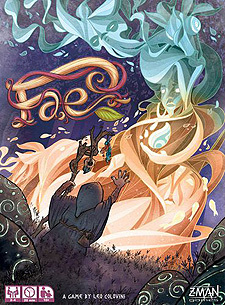 Released in 2002 as Clans and nominated for the Spiel des Jahres, Fae, features stunning new visuals and re-imagines the game in an otherworldly setting of mystery and wonder.